I have to admit I am a huge 3D project fan, but then if you follow my blog you would have already figured this out! This week at CASEing the Catty we are sharing our favourite Occasions catalogue Big Shot project. Remember, you can share your projects over on our Facebook group. Hands down I have to say I love boxes & all the wonderful things you can put in them. Today I am sharing a project I made way back at the start of the catalogue & haven't shared yet. It was one of my favourite projects to make & if I remember correctly my stamp club ladies got to make it too! I wanted to go for a neutral look & my all time favourite go to neutral paper is Kraft cardstock. As you can see I used the beautiful vanilla lace trim from the Annual catalogue & the So In Love stamp set from page 52 of the Occasions catalogue to make my little tags & matching cards. The tags come with the box thinlits. Next, I made 3 cards to fit inside. The little cards are actually made using the box thinlit. You just line the cardstock up slightly above the cutline of the open section of the framelit & tada a cute little card that fits perfectly inside the box. 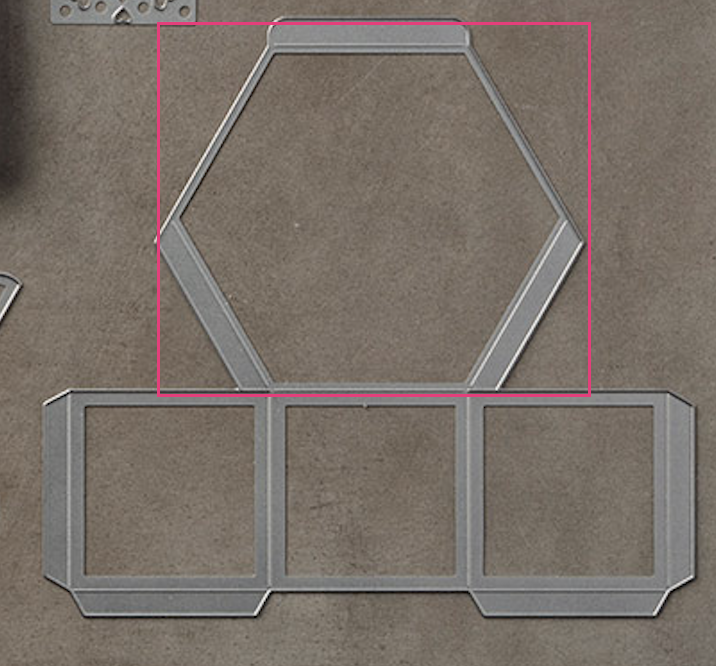 Here is the die & I have drawn where to put the pre-folded cardstock to create the cards below. Once cut you just cut off the little flaps it creates & you have a cute little hexagon card. 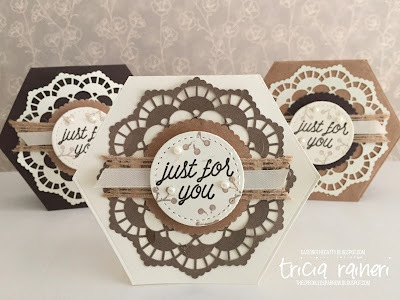 For my 3 cards, I used the Lace doilies & sponged Crumb Cake over the white side for the Vanilla doily card. The vanilla ribbon is also from the Occasions catalogue. Sadly, both the doilies & the Vanilla ribbons are retiring so if you love them as much as I do head over to my online shop pronto to grab them before they are all gone. Here they all are together. A nice little project to make for a gift. I only made 3 cards, however, the box would fit 6 easily. These remind me of a rustic wedding & would be perfect to give as a gift for Mother's day also. I was so happy to see the Window Box thinlits were not on the retirement list, so that means they will be carrying over - YAY! This means you get to play with it for at least another 12 months. 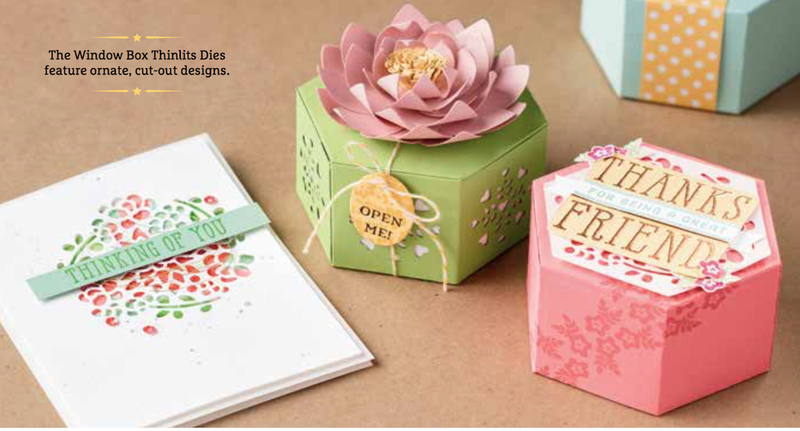 The very first thing I bought from the Occasions catalogue was the Window Box Thinlits Die. I knew I would use it lots, but I have to admit, it took a bit of practice to create this little beauty. There is quite a technique when assembling it & the easiest way to explain it is to refer you to the Stampin' Up! Youtube video, it saved my cardstock stash! Thanks so much for stopping by today. Next on the hop is Rachel @ Stampin' Pals. Keep the hop going & head on over to her blog by clicking the next blog picture below.